“Our industry partners tell us they want graduates who have hands-on experience, and practice working in teams and solving real-world problems in a clinical environment,” said Wendy Thomas, vice chair of academic affairs and associate professor of bioengineering. “Our graduates will also have practice working with all constraints of the business environment and the communication skills needed to facilitate a team of engineers, scientists, clinicians, business and venture capital investors. “The project-based master’s in applied bioengineering was designed to meet industry needs, and our industry partners are enthusiastic about the program,” Thomas said. Students will work alongside UW Medicine clinicians and UW faculty to identify unmet clinical needs and engineer practical solutions. Bioengineering’s clinical partnerships in the School of Medicine will provide an intensive mentoring experience with clinicians and firsthand learning about clinical culture and ethics. Following the clinical experience, students will work in small teams to conceive, design, develop and test a new biomedical device, process or technology, typically carrying the project through the proof-of-principle prototyping phase. Design instruction will include a set of core topics — principles for medical technology development, engineering design tools and prototyping methods — as well as mentoring tailored for the particular team projects. Students will have two options for their second-stage capstone experience: a summer industry internship or development of a device in an intensive process that complements their year-long design project. The Master of Applied Engineering builds on the department’s record of patents, licensing and startups, which is fostered by a strong culture of entrepreneurship that is characteristic of the UW College of Engineering. Students in the new program will take the department’s existing Program on Technology Commercialization series, and industry partners will serve as design project consultants; together these components provide an emphasis on entrepreneurship and business plan development. 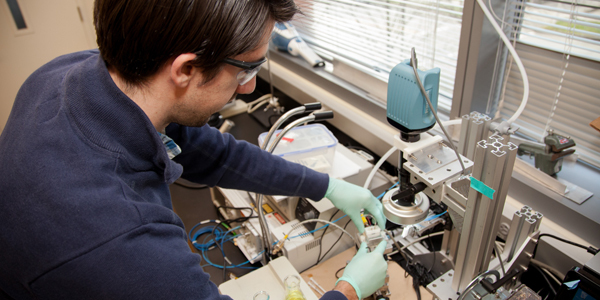 engths, offering degree focus areas in biomaterials, imaging and molecular bioengineering. “We’re offering the opportunity to work with faculty who are experienced in not only going through a bioengineering medical application design process, but with educating and mentoring those activities,” Neils said. Strong candidates for the program will have a bachelor’s or higher level degree in engineering, biological, physical or other applied scientific disciplines. For program inquiries, visit the program’s website or contact Chetana Acharya at bioeng@uw.edu. For press inquiries, contact Laura Wright at 206-543-8958 or lew3@uw.edu. Adapted from a Department of Bioengineering story.